Whether it’s individually or in a group, whether it’s for the young or the old, everyone has fun by practicing it because it gives joy, allows you to live healthy and is known to relieve stress. Do you know what I’m talking about? Yes! It’s Sports. Come discover some sports that originated from France. It was invented by monks in the XIIIth century who probably wanted to do some exercise! At the time, they played on the ground, the walls and the beams of the cloister. They used a ball and the palm of their hands, hence the name “Jeu de Paume”. It sure took a toll on the hands, even with gloves at the time, ouch, it was painful at the end of the game. This game has evolved over time and is now played with rackets, a net and a ball the size of an orange. In the end, this medieval discipline is more difficult than it seems, continues to be perpetuated thanks to the enthusiasm of its 10,000 followers around the world. “Devers”, “dedans”, to serve in “girafe” or in a “boomerang”, “faire une chasse”, to recover the engagement… At first, the terms of the Jeu de Paume seemed obsolete or convoluted, but offers the “paumistes” (players) a wide variety of strategies. The Jeu de Paume court looks like a tennis court but it is asymmetrical, featuring walls and walkways on three sides. The server should aim for the winning gallery on the opposite side of the court to mark a point. To score, you have to be able to make a winning shot by taking advantage of an opposing foul, but also to touch specific areas on the ground or the walls. In this ancestral discipline, the white outfit remains rigorous even for a simple game between friends. The balls also continue to be handmade. Small concession to modernity, they have adopted the yellow color of modern tennis since the 80’s, to offer a little more visibility. Asymmetric, each court has its own dimensions, giving a considerable advantage to those who play at home on familiar grounds… This is a particularly interesting side of this game since it is necessary to adapt to different courts. Finally, at this game, tactics are as important if not more than physical strength, which explains the longevity of the players. There is only one Jeu de paume court still in operation in France. Located in Paris and opened since 1908, it has its Art Nouveau ironwork and glass ceiling of a culminating eleven meters. This court is the highest in the world, especially suited to the famous serve called “Giraffe”, it’s all in the height. Another major enclosure that has been preserved and become a museum in Versailles: the famous Jeu de paume, where the third State, the clergy and the nobility met on June 20th, 1789 and swore an oath to draw up a new Constitution. Sipping a good pastis on a terrace, or standing among the players, who carries a high pitch for “avé l’assent”, you can’t miss the game as it unfolds in several parts, which is played daily in all parts of Provence and carries the pretty name of Pétanque. At the beginning of the 20th century, we were still playing on a span of 15 to 20 meter area, being three per team (shooter-midfield-pointer), performing three consecutive jumps before throwing the ball as close as possible to the cochonnet, it was the Provençal game. But during a game in June 1910 that took place in Ciotat, Mr. Ernest Pitiot proposed to a friend Jules le Noir, affected with rheumatism, to throw his balls by remaining inert and without jumping, being 2 or 3 meters from the cochonnet. Its position, the “pieds tanqués”, gave its name to this variant of the Provençal game, which became the pétanque. Sport or leisure, pétanque always remains as an institution whose motto is conviviality above all. Nonetheless, do not hesitate to participate in fiery games. You are already making friends when sharing a game of pétanque in Provence. With global stars like Mohamed Ali Klay and Floyd Mayweather, everyone knows boxing. Ring, ropes, boxing gloves and KnockOuts: This noble art is displayed everywhere in movies, magazines, newspapers and books. But we are much less aware of another combat sport quite similar to it but yet national … Of course we want to talk about French Boxing – “Savate” or “BF” for the intimate! Basically, Charles Lecour is the first in France to categorize a technique of combat intended to become the BF. The feet-fists type of boxing evidently using both hands and feet. Gloves, boxing shoes and a mouth guard. The men will complete their gear with a groin protection and the ladies will opt for a chest protector. ● “Assu” (Assaut): a form of encounter by a simple “touch” (contact), where full fist-punches are excluded, for when under 18 years old. ● Combat: a form of encounter where full power is allowed. However, the complete protection gear is mandatory..
Parkour is a growing discipline around the world. It is native of France. Parkour, or the art of mastering moving skills that consists in finding a way to overcome the obstacles, encountered as best as possible, using the following: running, jumping, climbing, which differentiates from a regular exercise in a gym. Overall, combining speed, fluidity, aesthetics and originality. Parkour initially requires good physical condition. One evolves with a daily and progressive training (Do not jump off a roof of 4m at the beginning). Thus, improving style, strength and endurance … and one’s spirit? By making jumps harder and harder and more dangerous, it builds self-confidence, consequently forging character at the same time. Thus Parkour is also based on philosophical qualities such as the solidarity between athletes, self-confidence, for self-progress and the joy of practicing. This is why Parkour affiliates as a philosophy. A French teenager named David Belle began practicing the sport from the mid-1980s to what he would call the Parkour. He was influenced and supported by his father Raymond, a firefighter from Paris and former military veteran of the obstacle course. He would later discover the natural training method of Georges Hébert. This French soldier, had developed this method to train his mind and body in harmony with nature. After moving to Lisses in the suburbs of Paris, David went along with his group of friends to correlate this method among their teenage games by moving through the city as effectively as possible by literally “flying over” the obstacles they would encounter. Little by little, passing over many small obstacles, became a sport, therefore Belle and his friends began to cross bigger ones and developing many techniques, like “saut du chat” (cat-jumping). Becoming more remarkable as they progressed, their practice is quickly spread via the web and television. In 1997, David Belle and Sebastian Foucan created the group “Yamakasi” which means “person with the strong spirit” in Lingala, Bantu language spoken throughout the northwestern part of the Democratic Republic of Congo. Parkour will become known to the general public thanks to the Yamakasi film (produced by Luc Besson) Suburb 13 and Suburb 13 Ultimatum distinguished by their spectacular stunts rather than their scenarios. Today, Parkour grows around the world with different styles that are born here and there. The media is also taking over using “Traceurs” (name for whom practices Parkour) for video clips, commercials and even movies! Sponsored by different brands like Red Bull or Adidas, athletes like Daniel Ilabaca, Yoann “Zephyr” Leroux make a living today from their Parkour practice, and appear in breathtaking videos seen by millions of Internet users. Despite different point of views, Parkour (and nearby disciplines such as Free Running) is increasingly becoming structured and associations are emerging around the world; in France, USA, Spain, India, Thailand, Russia and even Iran. The home-ball is a form of soccer, where the ball never leaves the field. The playing area is in a form of a big cage surrounded by nets with two opposite sides, which has colored targets inside allowing you to score points. In a game that last five minutes, both teams of 5 players must score in the yellow targets that are worth one, two or three points. And one of the main values ​​that allows the suspense in this sport is that there is a red target in the center that brings the score back to zero if the team scores in it. The main interest of this sport are the 4 yellow targets and the red target, which make this sport strategic, open and dynamic. 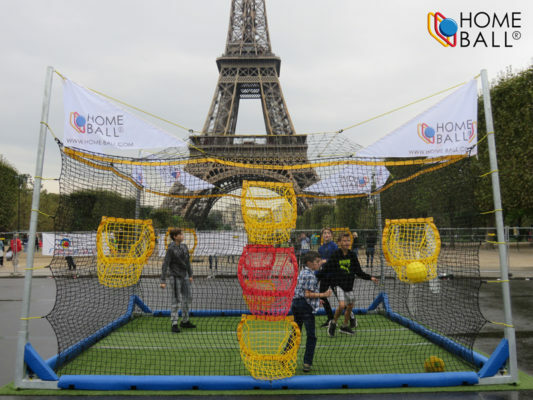 In contrast to most conventional ball sports (Football, Basketball, Handball, Rugby …), the home-ball not only has one goal, but 5 targets per side! The positioning of these targets and their values ​​have been studied and determined to allow the game to develop dynamically across the entire playing area. A home-ball player can score from almost anywhere since many different game positions and strategies are offered to him. It’s up to the player to make quick and precise choices because this game is especially fast! Discipline invented in France and today booming abroad. The principle of RugbyGolf is the same version as Golf, it is not to send a ball but a Rugby ball in a suitable target using your feet or hands. The goal is to reach the target in a minimum of attempts, same as Golf. One of the specifications of this sport is also the outfit, which is a mix of rugby and golf attire including rugby socks, shorts, a polo shirt and a beret. Whatever its origin or its rules, playing sports is really the base and the secret to a well balance and healthy life. 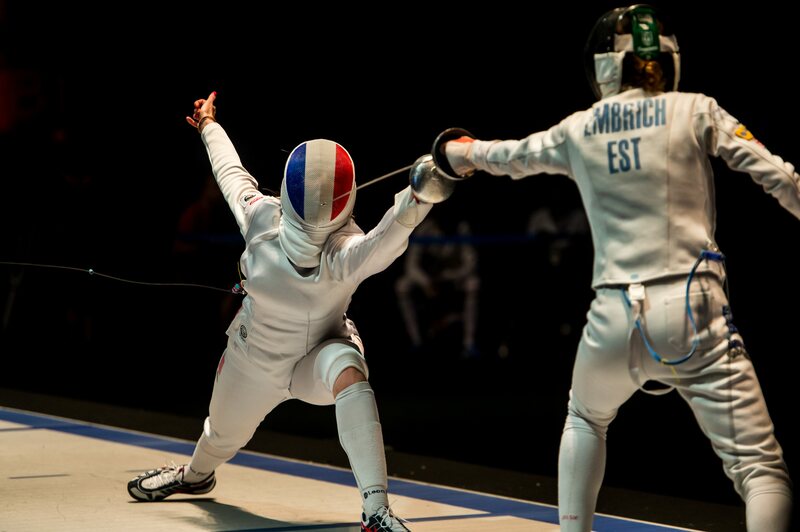 So do not hesitate to take the initiative to try one of these sports that originated in France.